In the eukaryotic cell, vesicular transport represents the basic mechanism for i) maintaining the homeostasis of the endomembrane system, ii) biosynthetic transport of newly synthesized proteins and lipids, and iii) the uptake and intracellular transport of exogenous macromolecules. Three classes of coated vesicles are well established to mediate transport in the exo- and endocytic pathway: COPII vesicles for ER export, COPI vesicles for retrograde Golgi-ER and bidirectional intra-Golgi transport, and clathrin-coated vesicles operating in the late secretory and endocytic pathway. Coat components are involved in multiple tasks such as cargo selection, curvature formation at the donor membrane, vesicle fission and initiation of uncoating. We are interested in the molecular mechanisms underlying intracellular transport by COPI coated vesicles. In contrast to COPII and clathrin coats, the heptameric large COPI coat component coatomer is recruited en bloc to the membrane, so that both the inner and outer shell of the vesicle are formed at the same time. Recently, the two coatomer subunits γ-COP and ζ-COP were found to exist in two isoforms. Each isoform is, like all other subunits, present in coatomer as one copy, resulting in four possible different heptameric protein complexes. We found that these coatomer isoforms localize differentially within the Golgi of mammalian cells, suggesting different sites of budding for each of them. In our view, the formation of a COPI transport vesicle involves the following minimal set of components: donor membranes with transmembrane proteins acting as coat and/or cargo receptors (e.g. members of the p24 family), cytosolic Arf1, cytosolic coatomer and auxiliary enzymes that serve as nucleotide exchange factors for activation on the membrane of Arf1 (GBF1) and GTPase activating proteins for the activation of GTP hydrolysis by Arf1 (Arf GAPs). We are studying the cooperation of these proteins in the formation of the COPI coat and in the scission of COPI coated buds with a wide range of methods in Biochemistry, Molecular Biology, Cell Biology and Biophysics. 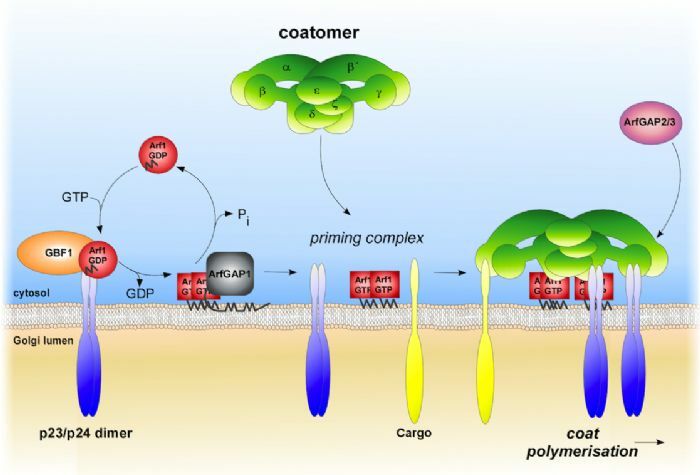 In collaboration with John Briggs’ and Irmi Sinning’s groups we are interested in the structure of the coat protein coatomer as a monomeric, soluble complex, as well as in its membrane bound form as a coating network. Our present view of the molecular mechanisms underlying the process of budding are depicted in the figure above. F. Wieland, M. Gleason, T. Serafini, J. Rothman (1987) The Rate of Bulk Flow from the Endoplasmic Reticulum to the Cell Surface. Cell 50, 289-300. M. R. Block, B. S. Glick, C. A. Wilcox, F. Wieland, and J. Rothman (1988) Purification of an N-Ethylmaleimide-Sensitive Protein Catalyzing Vesicular Transport. Proc. Natl. Acad. Sci.U.S.A. 85, 7852-7856. A. Karrenbauer, D. Jeckel. W. Just, R. Birk, R. R. Schmidt, J. E. Rothman, and F. Wieland (1990) The Rate of Bulk Flow from the Golgi to the Plasma Membrane. Cell 63, 259-267. T. Serafini, G. Stenbeck, A. Brecht, F. Lottspeich, L. Orci, J. E. Rothman, and F. Wieland (1991) A Coat Subunit of Golgi-Derived non-Clathrin Coated Vesicles with Homology to the Clathrin Coated Vesicle Coat Protein b-Adaptin. Nature 349, 215-220. G. Stenbeck, C. Harter, A. Brecht, D. Herrmann, F. Lottspeich, L. Orci, and F. T. Wieland (1993) b'-COP, a Novel Subunit of Coatomer. EMBO J. 12, 2841-2845. J. E. Rothman and F. T. Wieland (1996) Protein sorting by transport vesicles. Science 272, 227-234. K. Sohn, L. Orci, M. Ravazzola, M. Amherdt, M. Bremser, F. Lottspeich, K. Fiedler, J. B. Helms, and F. Wieland (1996) A major transmembrane protein of Golgi-derived COPI-coated vesicles involved in coatomer binding. J. Cell Biol. 135, 1238-1248. C. Reinhard, C. Harter, M. Bremser, B. Brügger, K. Sohn. B. Helms, and F. Wieland (1999) Receptor induced polymerisation of coatomer. Proc. Natl. Acad. Sci. U.S.A. 96, 1224-1228. M. Bremser, W. Nickel, M. Schweikert, M. Ravazzola, M. Amherd, C.A. Hughes, T.H. Söllner, J. E. Rothman, and F. T. Wieland (1999) Coupling of coat assembly and vesicle budding to packaging of putative cargo receptors. Cell 96, 495-506. D. Gommel, A. R. Memon, A. Heiss, F. Lottspeich, J. Pfannstiel, J. Lechner, C. Reinhard, J. B. Helms, W. Nickel, F. T. Wieland (2001) Recruitment to Golgi Membranes of ADP-Ribosylation Factor is mediated by the cytoplasmic domain of p23, EMBO J. 20, 6751-6760. 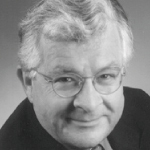 C. Reinhard, M. Schweikert, F.T. Wieland, W. Nickel (2003) Functional reconstitution of COPI coat assembly and disassembly using chemically defined components. Proc. Natl. Acad. Sci. USA 100, 8253-8257. D. Wegmann, P. Hess, C. Baier, F. T. Wieland and C. Reinhard (2004). Novel isotypic g/z-subunits reveal three coatomer complexes in mammals. Mol. Cell. Biol. 24, 1070-1080. J. Moelleken, J. Malsam, M.J. Betts, A. Movafeghi, I. Reckmann, I. Meissner, A. Hellwig, R.B. Russell, T. Söllner, B. Brügger and F. Wieland (2007): Differential localization of coatomer complex isoforms within the Golgi apparatus. Proc. Natl. Acad. Sci. USA, 104: 4425-4430. R. Beck, Z. Sun, F. Adolf, C. Rutz, J. Bassler, K. Wild, I. Sinning, E. Hurt, B. Brügger, J. Béthune*, and F. Wieland* (2008) Membrane curvature induced by Arf1-GTP is essential for vesicle formation. Proc.Natl.Acad.Sci.USA, 105:11731-6. R. Beck, S. Prinz, P. Diestelkötter-Bachert, S. Röhling, F. Adolf, K. Hoehner, S. Welsch, P. Ronchi, B. Brügger, J.A. Briggs, and F. Wieland (2011) Coatomer and dimeric ADP ribosylation factor 1 (Arf1) promote distinct steps in membrane scission. J Cell Biol. 194(5):765-77. Functioning and processing of membrane proteins critically depend on the way their transmembrane domains (TMDs) are embedded in the membrane. Sphingolipids are structural components of membranes and can also act as intracellular second messengers. Not much is known of sphingolipids binding to TMDs of proteins within the hydrophobic bilayer, and how this could affect protein function. To our surprise, we found a direct and highly specific interaction of exclusively one sphingomyelin species, SM 18, with the TMD of the COPI machinery protein p24. Strikingly, the interaction depends on both the head group and the backbone of the sphingolipid, and on a signature (molecular recognition determining structure (MRDS) VXXTLXXIY within the TMD. Molecular dynamics simulations show a close interaction of SM 18 with the TMD (see figure on the left). We suggest a role of SM 18 in regulating the equilibrium between an inactive monomeric and an active oligomeric state of the p24 protein, which in turn regulates COPI-dependent transport. Bioinformatic analyses predict that the MRDS represents a conserved sphingolipid-binding cavity that exists in a variety of mammalian membrane proteins. Thus, in addition to a function as second messengers, sphingolipids can act as cofactors to regulate the function of transmembrane proteins. Our discovery of an unprecedented specificity of interaction of a TMD with an individual sphingolipid species adds to our understanding of why biological membranes are assembled from such a large variety of different lipids. We have defined a number of trans-membrane proteins as candidates for specific interaction with sphingolipids, and in the future will investigate structure and function of such lipid/trans membrane complexes. A. Karrenbauer, D. Jeckel. W. Just, R. Birk, R. R. Schmidt, J. E. Rothman, and F. Wieland (1991) The Rate of Bulk Flow from the Golgi to the Plasma Membrane. Cell 63, 259-267. D. Jeckel, A. Karrenbauer, K. N. J. Burger, G. van Meer, and F. Wieland (1992). Glucosylceramide is synthesized at the cytosolic surface of various Golgi subfractions. J. Cell Biol. 117, 259-267. A. Brüning, A. Karrenbauer, E. Schnabel, and F. Wieland (1992) Brefeldin A-Induced Increase of Sphingomyelin Synthesis. J. Biol. Chem. 267, 5052-5055. M. Murata, J. Peränen, R. Schreiner, F. Wieland, T. V. Kurzchalia, and K. Simons (1995) VIP21/caveolin is a cholesterol-binding protein. Proc. Natl. Acad. Sci. U.S.A. 92, 10339-10343. H. Lannert, K. Gorgas, I. Meißner, F. Wieland, and D. Jeckel (1998) Lactosylceramide and subsequent glycosphingolipids are synthesized in the late Golgi. J. Biol. Chem. 273, 2939-2946. B. Brügger, R. Sandhoff, S. Wegehingel, K. Gorgas, J. Malsam, B. Helms, W.-D. Lehmann, W. Nickel, and F. Wieland (2000) Evidence for Segregation of sphingomyelin and cholesterol during formation of COPI-coated vesicles. J. Cell Biol. 151, 507-517. I. Gkantiragas, B. Brügger, E. Stüven, D. Kaloyanova, X. Li, K. Löhr, F. Lottspeich, F. T. Wieland, and B. Helms (2001) Sphingomyelin-enriched microdomains at the Golgi complex. Mol. Biol. Cell 12, 1819-1833. P. Haberkant, O. Schmitt, F.-X. Contreras, C. Thiele, K. Hanada, H. Sprong, C. Reinhard, F. T. Wieland, B. Brügger (2008). 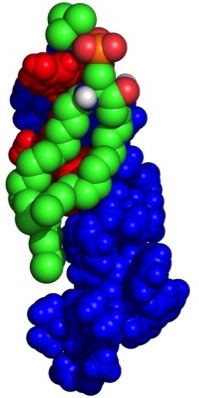 Protein-sphingolipid interactions within cellular membranes. J. Lipid Res. 49(1):251-62. F.-X. Contreras, A.M. Ernst, P. Haberkant, P. Björkholm, E. Lindahl, B. Gönen, C. Tischer, A. Elofsson, G. von Heijne, C. Thiele, R. Pepperkok, F. Wieland, and B. Brügger (2012) Molecular recognition of a single sphingolipid species by a protein’s transmembrane domain. Nature. 481:525-529. A.M. Ernst, F.-X. Contreras, C. Thiele, F. Wieland & B. Brügger (2012). Mutual rocognition of sphingolipid molecular species in membranes. Biochim Biophys Acta - Biomemb. 1818(11): 2616-2622.